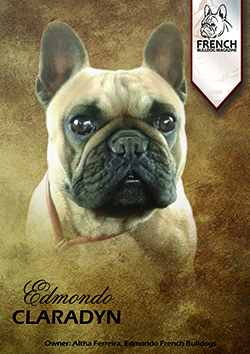 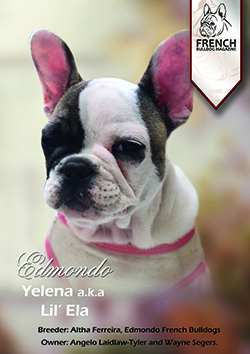 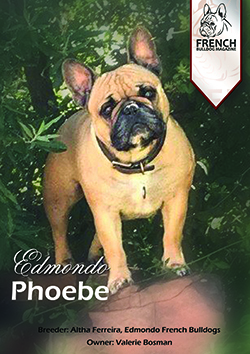 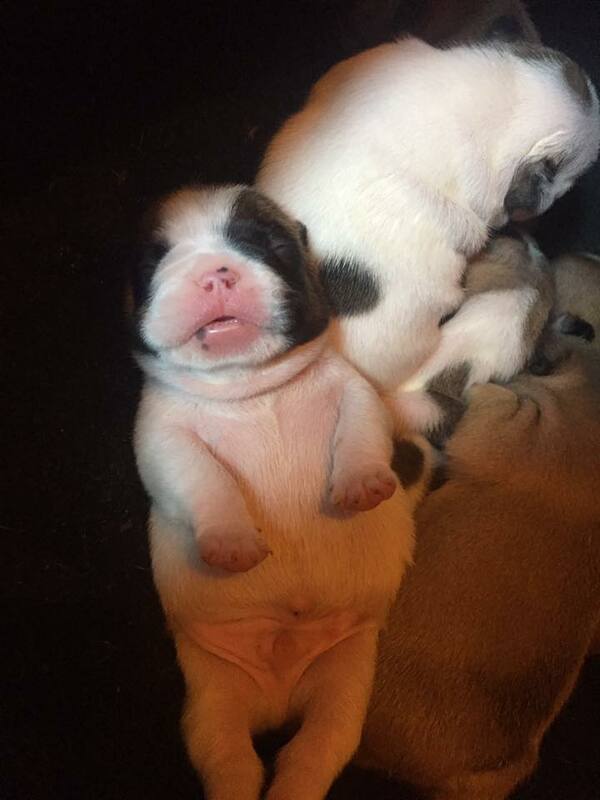 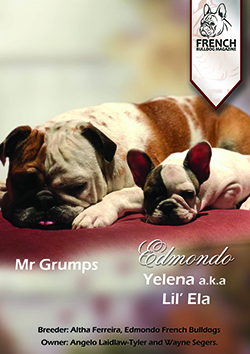 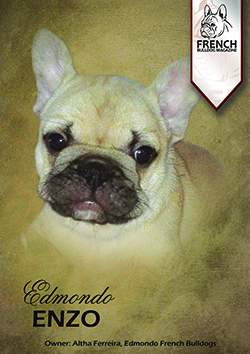 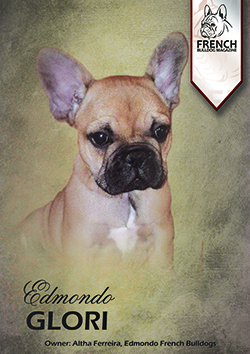 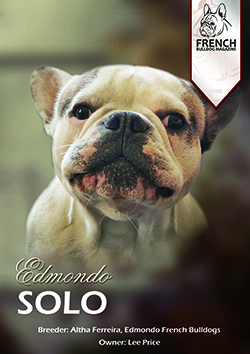 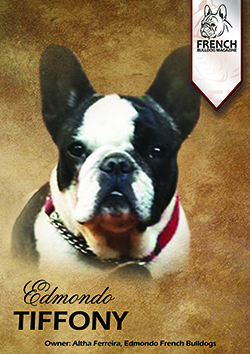 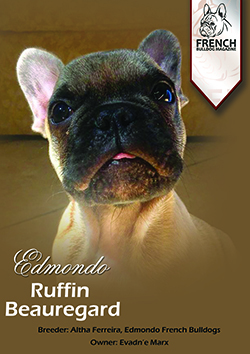 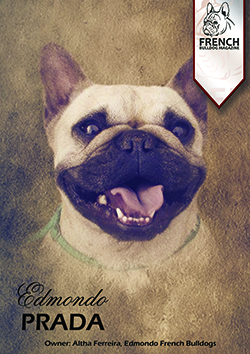 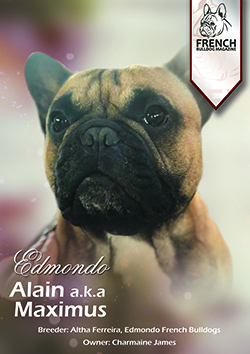 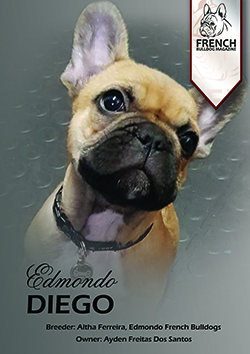 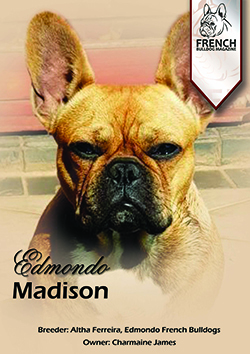 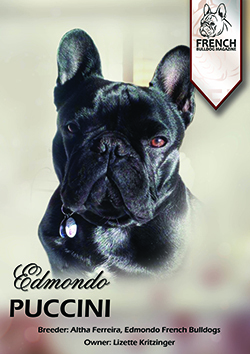 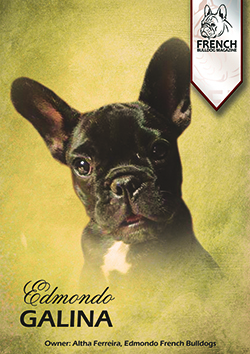 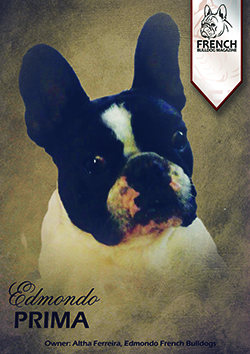 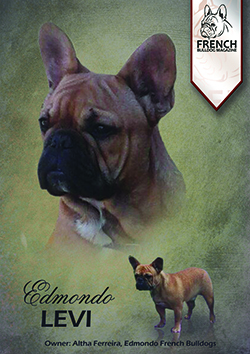 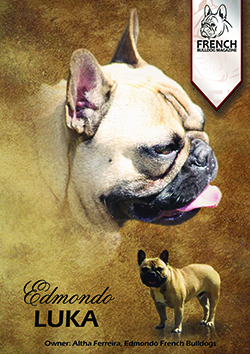 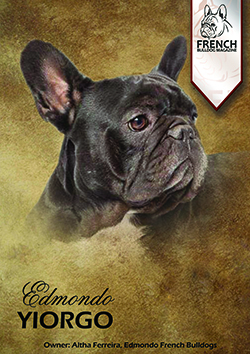 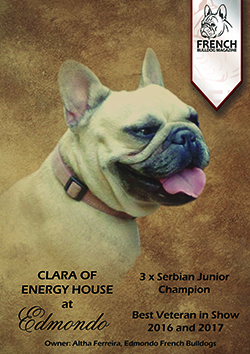 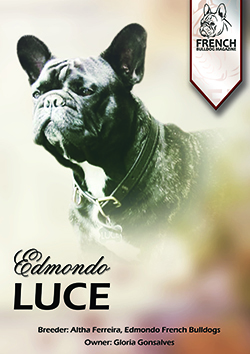 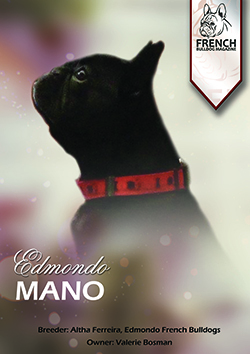 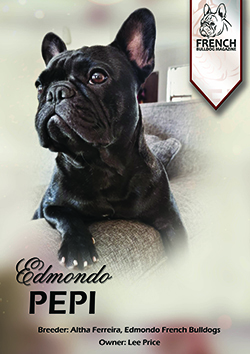 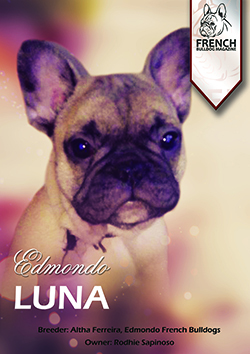 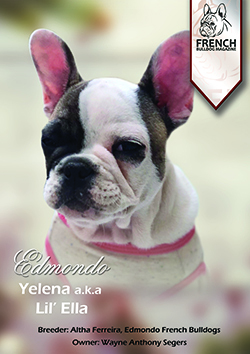 Edmondo are Breeders of top quality Champion Bloodline French Bulldogs. 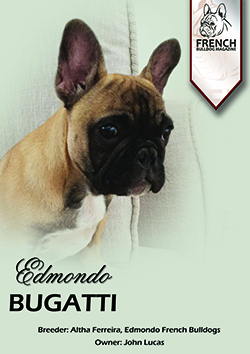 Our mission is therefore to strive for nothing but perfection of this very unique breed. 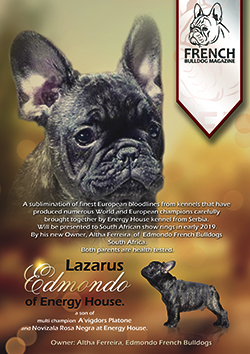 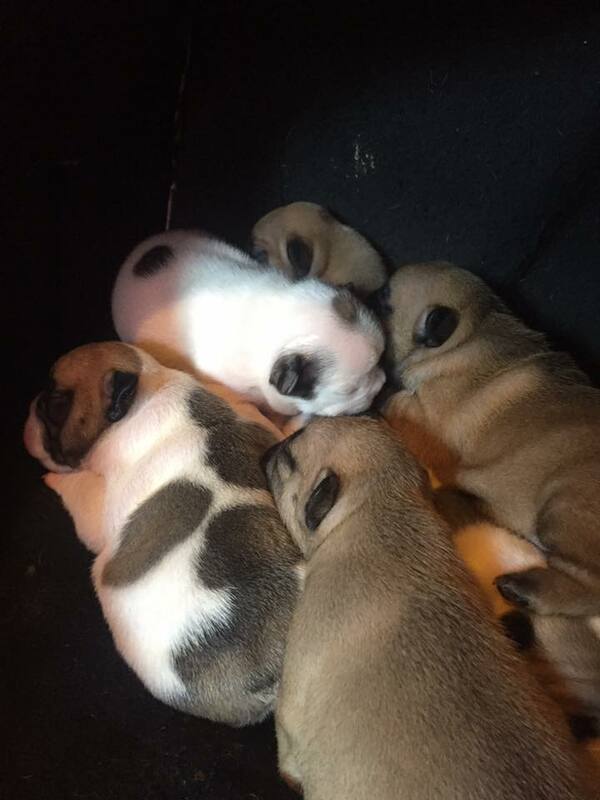 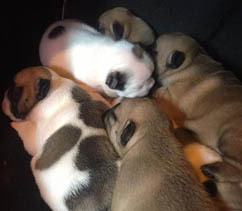 With our Top Champion Bloodline Imported Breeding Pairs, we are producing some of the best quality French Bulldogs in Southern Africa. 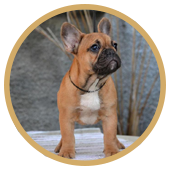 The grooming requirements for the French Bulldog are relatively low, which is ideal if you do not have that much time to dedicate to grooming. 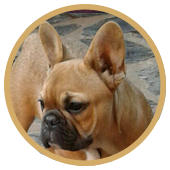 His short coat needs an occasional brushing to keep it looking good, and you should ensure that the wrinkles and folds on his face are cleaned, and that you check his ears are dry and clean to avoid infection and for hygiene reasons. 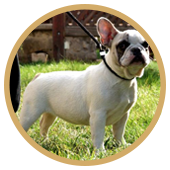 This is a fairly low shedder on a seasonal basis, and so may prove suitable for those with allergies. 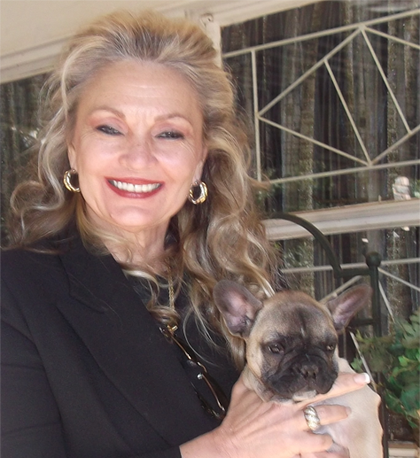 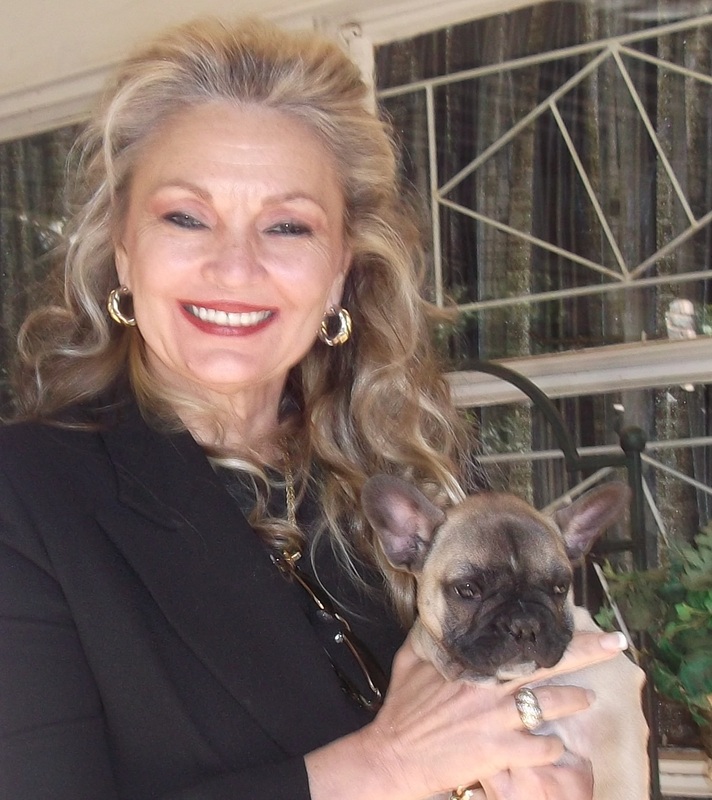 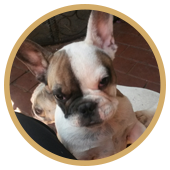 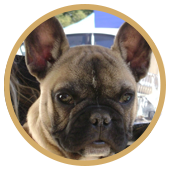 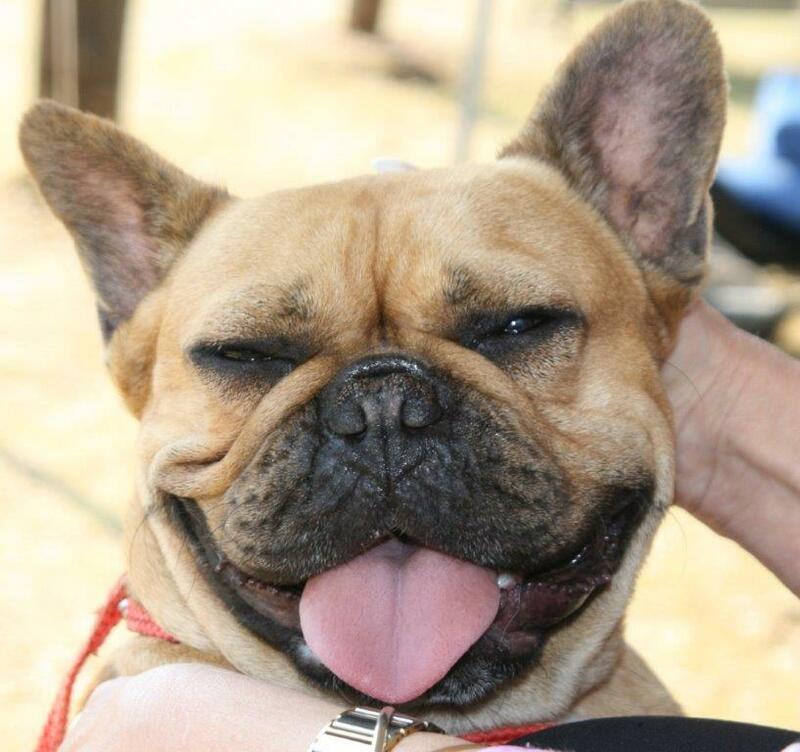 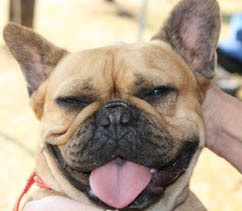 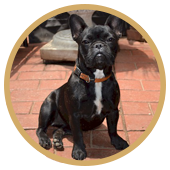 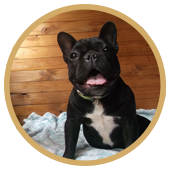 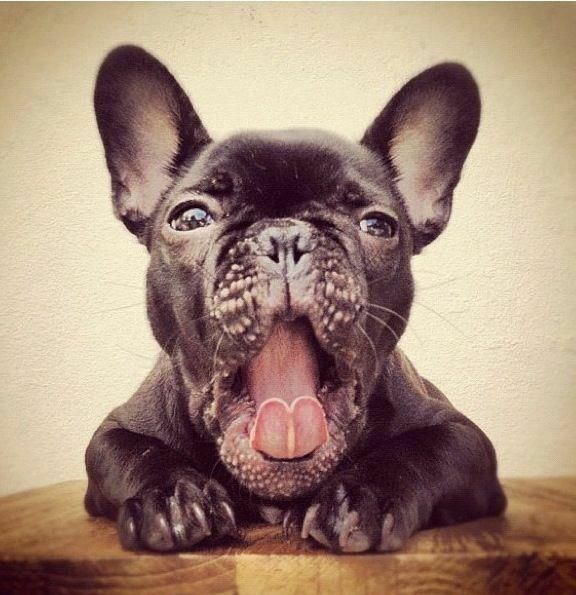 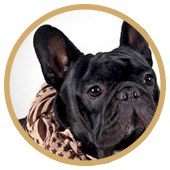 Give us a call on +27(0)12 993 1111 or +27(0)83 325 2644 to discuss your French Bulldog requirements. 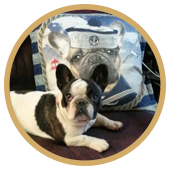 "Frenchies are perfect city dogs since they do well in small spaces! 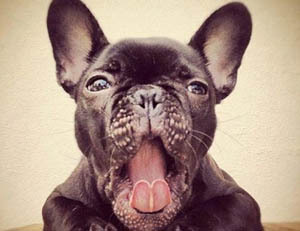 Pretty much everyone I know in NY has a frenchie. 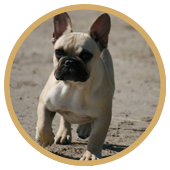 Frenchies aren’t incredibly active dogs so they don’t need a big yard or anything to run in. 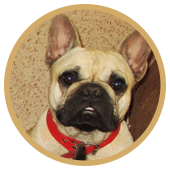 They’re very well mannered which makes them the perfect dog for a smaller space!" 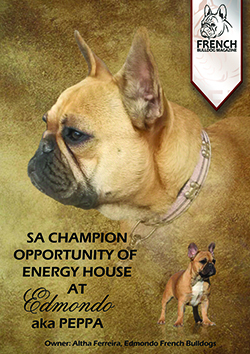 Peppa has been awarded CHAMPION! 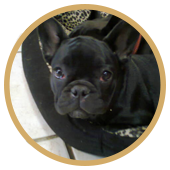 Peppa is following in the footsteps of her very well known Parents and famous Grand Parents. 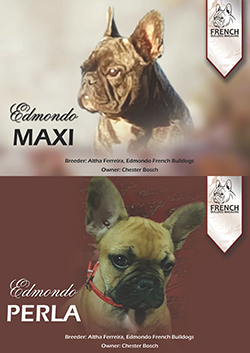 French Bulldogs are our PASSION!